The Oliver Safety Footwear line from Honeywell Safety Products is made for women—this is her boot, not his boot for her. Built on lasts that are specific and proportional to a woman’s foot, the woman’s series of safety footwear is feminine with pops of color and attention to detail she can appreciate. 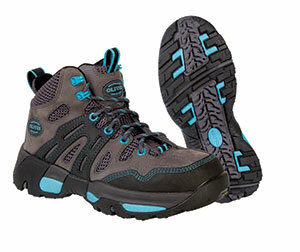 The Women’s Industrial Hiker features steel-toe impact protection that is sleek and feminine yet roomy for wearer comfort.